New Year’s is almost upon us! As you’re picking out the party favors for your New Year’s festivities, why not try something new that will have all your party guests talking? Why not try bacon and cheese flavored grasshoppers in a can! Yes, you heard me right… Bacon and cheese grasshoppers in a can! With each subsequent word, that statement gets better! Let’s face it… You had us all at bacon! Whether you’re the super adventurous type, or maybe just slightly insane, I’ve got a treat for you. A company in Thailand is offering these delectable treats, along with many more. Thailand is long known for eating bugs, and as many Thais moved throughout the globe, they still wanted to eat bugs. So a Thai entrepreneur started canning and exporting the bugs in a variety of flavors. Yup, flavored bugs in a can! The latest is bacon and cheese grasshoppers. 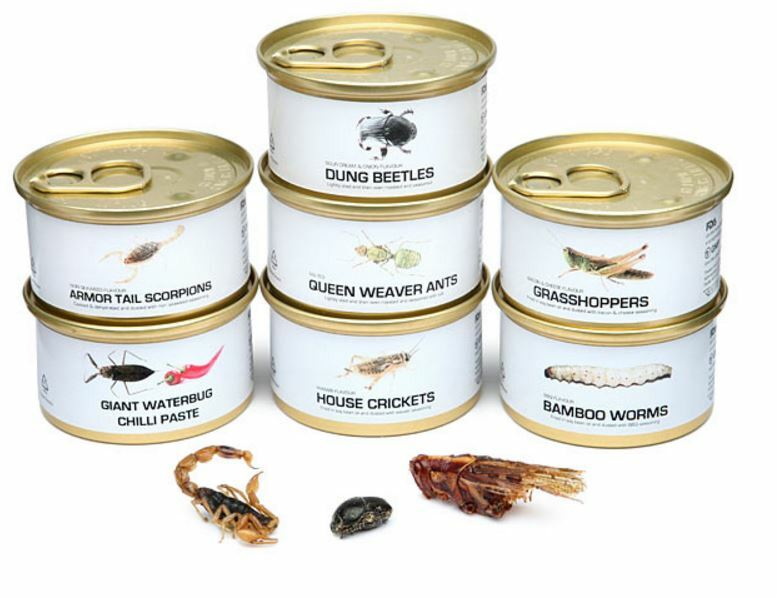 If you’re got a hankering for the creepy crawlies, it’ll cost you $40 for a box of 7 cans. The product comes from Thailand, and the manufacturing facility is registered with the Thai FDA (Food & Drug Administration) and the US FDA and has passed GMP (Good Food manufacturing). All individual food products are tested and registered with FDA, so it sounds like they’ve gotten the green light for consumption here in the United States. Someone will have to let me know how the Sour Cream and Onion Dung Beetles taste… I wonder what kind of cleaning process the dung beetles go through before being canned!?! I mean, they spend there lives playing with balls of crap. So it is farewell to 2015, and Blog Pest Control would like to express our gratitude for another remarkable year. We’d like to thank you the reader for your valuable support, comments, social media shares, and feedback throughout the past year. All of us here at Blog Pest Control would like seize this opportunity to wish you all a Happy New Year 2015. May the coming year bring prosperity, joy, and happiness to all of you! Cultures and regions are so different really, like in the bugs eating worlds its surprising to eat bugs here in Kenya. But the most delicious meal we accept in our culture and trend is the TERMITES EDIBILITY. There is termite specy consumed raw or to be cooked, fried in many of Kenyan tribes at present. Termites provides valuable nutritional meals and its affordability, easy access, culturally rich in most of Africans indigenous tribes. But poses with other negative implications of human structure attack unnoticeable till late after termite destruction have occurred. Its control should be put in place even though it helps in other supply of food source.